We’d love your help. Let us know what’s wrong with this preview of This She'll Defend by Melissa Miles. When Carmen's husband Ed was offered a job in Darmstadt, Germany, she jumped at the chance to embark on this new adventure as a family. But she stays so busy as a wife and mother of twins that she barely takes time to glance in a mirror anymore; basically forgetting that she is still a beautiful and vibrant woman. Carmen has a life that anyone would envy; a loving husband, When Carmen's husband Ed was offered a job in Darmstadt, Germany, she jumped at the chance to embark on this new adventure as a family. But she stays so busy as a wife and mother of twins that she barely takes time to glance in a mirror anymore; basically forgetting that she is still a beautiful and vibrant woman. To ask other readers questions about This She'll Defend, please sign up. 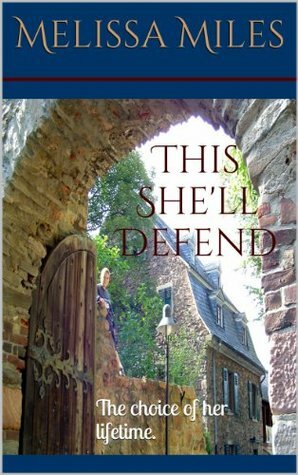 I have been to Germany once and it was great to have a chance to revisit Germany through this story. I liked reading about the travels the family went on, and the stories about the kids, which made me laugh out loud. I would highly recommend this book to anyone who likes a good family story! I'm a bit biased, but I loved the book! From the beginning u fall in love with Ethan! He's such a gentle man. Carmen,-beautiful strong independent mother of twins married to ed. The family have moved to Germany as ed works in the military. They live a pretty ordinary life,,, untill a young soldier splashes in to their life. Ethan is a strapping army boy from Texas, who is placed with the family through the ACS, a group that helps soldier s away from home. He becomes one of the family but rea This she'll defend!!! He becomes one of the family but realise he loves one particular family member more... Carmen! He bares his love fir her, but does she feel the same? Can she be unfaithful and leave ed? Or is her love for him stronger than that? Melissa I didn't know what I would be getting picking up this book,,but it surprised me and I enjoyed it. It was lovely to see a true gentleman for a change and not insta love. I loved this book! I really felt that I was magically transported to Germany while reading this book. I love the way the author depicts Carmen's love of her family above all else, and their lives in Germany living in a military community as a civilian. It's a wonderful story, told with dignity. A definite must read. I thoroughly enjoyed this book and am looking forward to reading more from Melissa Miles. A refreshing combination of military life, European travelogue and moral choices. A must read! Melissa Miles is a Registered Nurse and a Certified K-12 teacher. She recently founded a nonprofit, Superhero Success Foundation to help raise awareness of special needs kid and donate copies of Jeremiah Justice Saves the Day to children's hospitals, schools, and programs for special needs kids. Jeremiah Justice is her latest book. Melissa is a member of SCBWI and serves as the local liaison for t Melissa Miles is a Registered Nurse and a Certified K-12 teacher. She recently founded a nonprofit, Superhero Success Foundation to help raise awareness of special needs kid and donate copies of Jeremiah Justice Saves the Day to children's hospitals, schools, and programs for special needs kids. Jeremiah Justice is her latest book.